Villa Forty in Cromer sleeps 6 people. This comfortably furnished, terraced holiday villa sits within a private resort which is on the cliff top next to the Royal Cromer Golf Club, overlooking the seaside resort of Cromer in an Area of Outstanding Natural Beauty, and offers home from home comforts with its own sitting-out area and furniture. Set amid wooded grounds with panoramic views, there is easy access to excellent cliff top walks while a stepped path leads down to the coast. Guests have shared use of the on-site facilities including an indoor heated swimming pool, a spa bath, sauna, steam room and fitness studio (guests please note most leisure facilities are available free of charge from the Spring Bank Holiday until the end of September). A bar/restaurant for dining in or take-away is available all year. Within a mile is the popular, traditional Victorian seaside resort of Cromer with wide sandy beach, lifeguard (summer season), grass tennis courts, an 18-hole cliff top golf course, promenade gardens and during the summer season, live entertainment in the little theatre at the end of the pier. Sheringham, 5 miles, offers a further sandy beach. RSPB nature and bird reserves are found at Cley, Blakeney and Morston. For children there is Banham Zoo, Wroxham Barns and Craft Centre, and the Dinosaur Adventure Park at Lenwade. Shops and pubs 1 mile, restaurant and bar (on site) 200 yards. Economy 7 NSH and electric extra charge per week. Bed linen included. High-chair. Freeview TV. DVD. Electric cooker. Microwave. Shared laundry room with coin-operated w/machine and t/dryer. Terrace with sitting-out area and furniture. 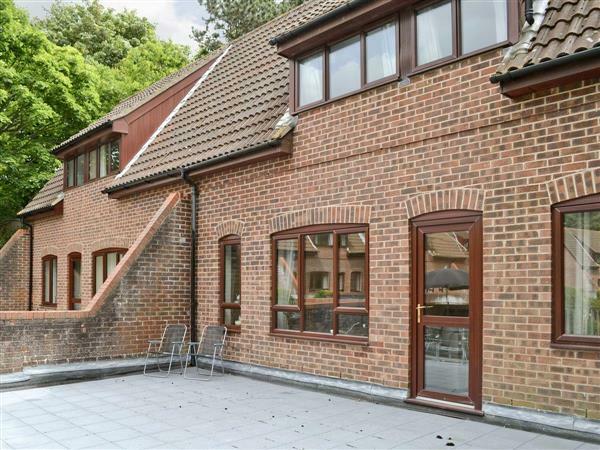 3 acres of shared landscaped and wooded grounds. Parking (1 car). Shared indoor heated swimming pool (depth 0.6m to 2.4m), with shower and changing facilities. Shared hot tub, spa bath, sauna, steam room and fitness studio. Welcome pack. No smoking. NB: Most of the leisure facilities listed are available free of charge from the Spring Bank Holiday until the end of September. Steps and sloping banks in grounds. Holidays at Villa Forty run from Saturday to Saturday. For a better idea of where Villa Forty is, you can see Villa Forty on the map below. Villa Forty is in Norfolk; should you be on the lookout for a special offer, you can find all the special offers in Norfolk. It's always worth checking to see what is on offer at the moment. Do you want to holiday near Villa Forty (27149), you can see other cottages within 25 miles of Villa Forty; have a look to find your perfect holiday location.